Khenpo Jamyang was born in Tibet. He followed the primary school in Tsche De Cheu, a village in South Tibet. He became a monk at Samye Monastery where he practiced rituals, studied Buddhist philosophy, logic, metaphysics and many other aspects of the Tibetan culture with Nawang Gyalpo Rinpoche. He continued to study Buddhist philosophy and tantric Buddhism with His Holiness the 41st Sakya Trizin, Khenpo Appey Rinpoche, Khenpo Tsul Trim Gyaltsen, Padang Rinpoche and Lama Jamseng Rinpoche, Khen Rinpoche Mig Mar in different places and monasteries in Tibet. He made numerous solitary retreats in the mountains of Tibet. His Holiness the 41st Sakya Trizin had chosen Jamyang Rinpoche as the Khenpo of Samye Monastery. 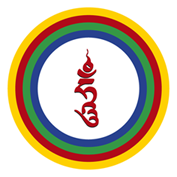 Khenpo Jamyang has written a great work on the history of Samye Monastery. He is currently living in Switzerland, where he is the Lama of Sakya Dechen Ling Baulmes.